Smoking cessation – for all employees …oh what a wonderful corporate culture it would be…………. 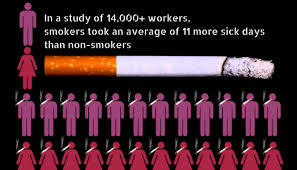 What does it cost you to have smokers in your workforce? Two types of employer costs to consider caused by tobacco use in the workplace.  Indirect Costs are expenses not immediately related to treatment of disease. They include lost wages, lost workdays, costs related to using replacement workers, overtime expenditures, productivity losses related to absenteeism and productivity losses of workers on the job. reduces potential legal liability. Nonsmokers harmed by secondhand smoke at work have won lawsuits and disability claims against their employers. Employees who take four 10-minute smoking breaks a day actually work one month less per year than workers who don’t take smoking breaks. On average, tobacco users cost drug plans two times as much as non- tobacco users. The American Productivity Audit, a national survey of over 29,000 workers, found that tobacco use was a leading cause of worker lost production time—greater than alcohol abuse or family emergencies. Quitting smoking, or even just cutting back, improves a worker’s productivity. A June 2013 study Professor Micah Berman of Ohio State U reveals the costs of employees who smoke is far greater than estimated by the CDC. The average cost burden of a smoker to the employer is $6,000/year greater than a never smoked employee. Professor Berman’s data is crucial to companies considering implementing a smoking cessation program.